90% of dentists now fear being sued. Are you sufficiently protected? A new study into trends, and opinion among dental professionals, shows the significant levels of fear of being sued in the industry. Good insurance cover is key to your protection. Here we look at increasing claims against dentists, the rising risk of being sued and how to get protected. Research shows that the number of claims of more than £100,000 made against dentists has significantly increased over recent years – up from just two in 2006 to 11 in 2015 (DDU). 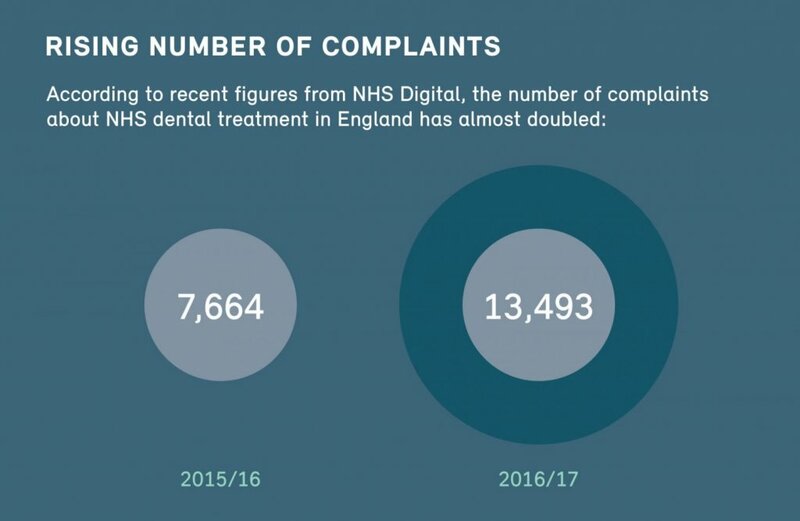 On top of this, according to a Medical Protection Society 2017 study, clinical negligence claims against UK dentists have doubled in the last ten years, standing at 13,493 in 2016/17. With those statistics in mind, it is no surprise that 90% of dentists fear being sued. There is a clear need to reduce the number of claims and for dentists to suitably protect themselves in preparation for a lawsuit. Dental professionals have their own opinions on these risks. 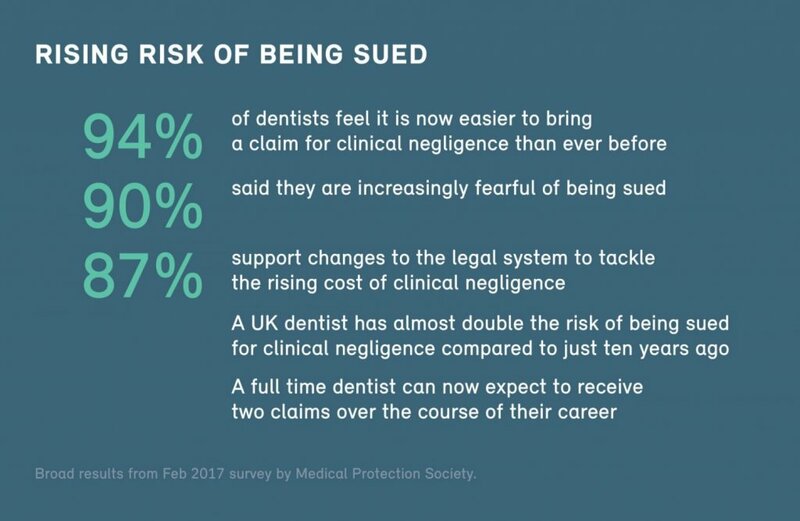 A Dental Protection survey found that 81% of practitioners believe that media portrayal of clinical negligence is the reason that claims have increased. They also believe that patients’ expectations of the service they should receive has increased. It’s not just newspapers, news or tv programmes that affect consumers’ actions. Social media has a huge impact – with people easily able to voice complaints, often not giving a dental practice the chance to respond first. Workload is also seen as an issue. 28% of respondents believe that being overworked makes it difficult to give their patients care to the best of their ability. A lack of experienced dentists is an increasing problem that is taking its toll on the rest of the industry. As you might expect, this has a knock on effect on mental and physical wellbeing. For dentists that have been involved in a claim, 83% have experienced stress or anxiety, with other outcomes including an impact on morale, confidence and health. How can dentists get protected? With most dentists believing that it is easy to bring a claim against them, what can be done to keep your reputation safe, and health unharmed? 64% of respondents to the Dental Protection survey think that a robust complaints procedure at their practice has a positive impact on dealing with patient grievances. 87% of dentists in Medical Protection Society’s research would like to see changes to the legal system so that the costs involved in clinical negligence claims can be managed. As a dentist, the one thing that you can do to protect yourself is to make sure you have the right insurance. Many dentists still rely on a discretionary policy, rather than a contractual one. These are usually provided by a medical defence organisation. This means that they may not pay out on a claim. A contractual policy with claims made cover, like indemnity insurance provided by All Med Pro, offers far better protection. Your career is important. To make sure you have the best cover in the event of a claim – to protect your livelihood and wellbeing – contact a dental insurance specialist at All Med Pro to see how we can help.